This is a basic beanie hat that I created with just under 4 oz oz of worsted weight yarn for the largest size. Instructions for making to fit babies, toddlers, tweens/teens. 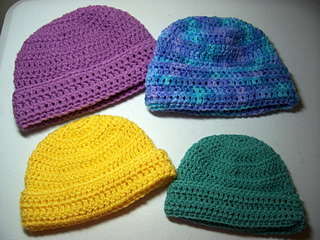 The 2 smaller sizes use sport weight yarn with either an F or G hook, and the 2 larger sizes use worsted weight yarn with either an H or I hook. All use just 1 ball of yarn. Features a special technique to make the brim sit flipped up perfectly.